Some spend Friday nights at a pub or at a club. Others are up really really late drafting patterns and sewing muslins. But burning the midnight oil at my sewing table have certainly paid off. 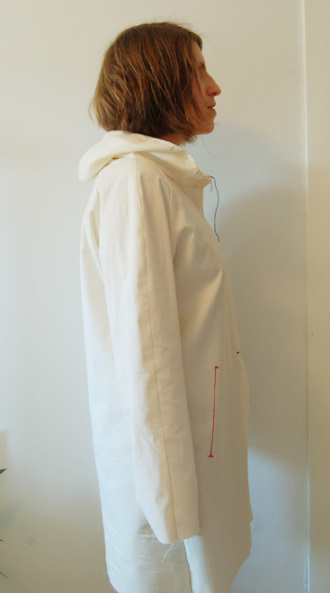 Today I put the finishing touches on my first muslin for the rain jacket. 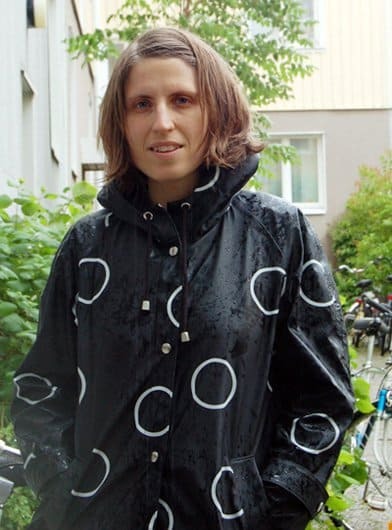 The scrubs like muslin fabric doesn’t have quite the pizazz of the actual rain coat fabric, but the shape looks pretty much the way I want it to. But how can you tell if a raglan sleeve fits the way it’s supposed to? I consulted all my sewing and fitting books and no one mention this. I guess the authors assume that the sleeve is always drafted by pros and not by clots so they only address body type related fitting issues. 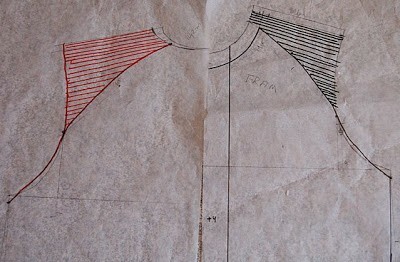 I had two major challenges when drafting this pattern that I will talk about a bit. The hood. Really tricky this one. Firstly a hood can come in many shapes and sizes. I actually knew what I wanted, a fitted hood with a band in the middle, but none of my pattern books got this right, I think the major problem is that they didn’t take into account the size and ease of the hood. Both the instructions I tried just gave out some generic numbers to work with and both hoods ended up way to big. Luckily Cidell came to the rescue and mailed me pages from her pattern making book that included instructions on how to make a hood based on your own measurements. The raglan sleeve. I think that the pattern making book writers need to make up their mind on which method is the best. So far I’ve seen five different methods, all resulting in pretty different shapes. Totally confusing. I ended up using an amalgam of two drafting instructions and I think it worked out okay. Are everyone familiar with the principles behind a raglan sleeve? 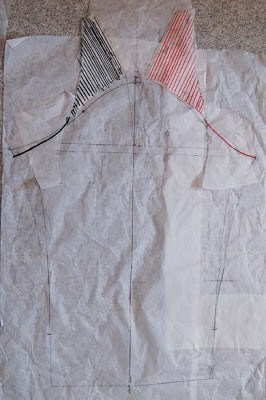 If not, what you do is cutting away the upper part of the back and front bodice. Then you attach them to the regular sleeve. 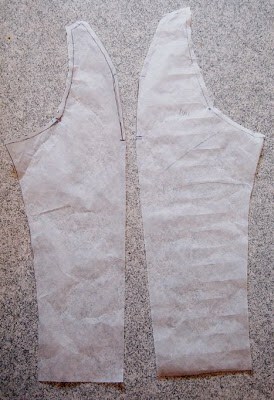 I did a two piece raglan sleeve so after placing the bodice pieces on the sleeve I cut it all in half. And finally a parting shot. 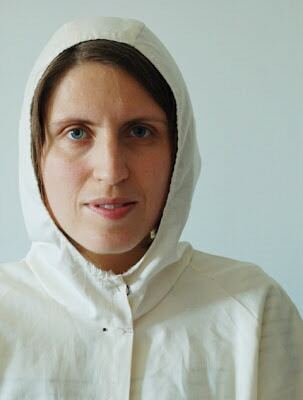 What does a Swedish indie pop band do when posing for their press photos? Well they put on their rain coats of course! LOTS of progress. The hood is perfect. This is going to look terrific in your raincoat fabric! I’m going to have to get seriously to work this coming week! The raglan sleeve seems so obvious now that you’ve shown it, but I never would have figured that out myself! Your hood looks great. Looking good. What a lot of work drafting is. Very impressive effort. That looks incredible! It hangs beautifully. How many muslins to get it to this? So far, so good! Congratulations on some hard work! Thank you everyone. This is my first and my last muslin – I refuse to do one more! But I have spent many hours processing and double check everything before I actually started cutting it out. Still a huge relief that it turned out okay on the first try. Great final look and fit! As Christina says, seems obvious when you see it, but I wouldn’t have figured it out myself. Love, love raglan sleeves! I’ll have to try it on my TNT tee. That’s a sharp-looking muslin! Maybe you can dye it or paint it and wear it… seems too nice to not wear. Awesome band photo. My husband loves Dungen. It is funny to hear him sing along phonetically, with no idea what they are actually saying. 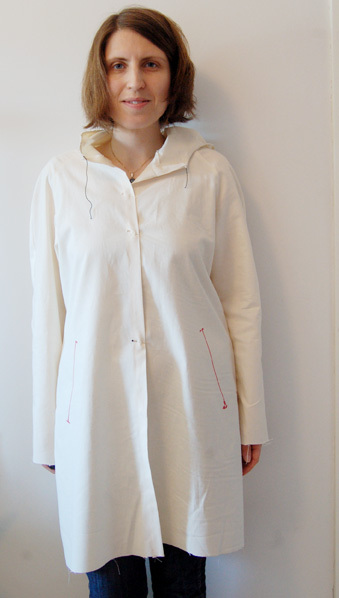 Great designs, although some may argue that lab coats only serve to keep doctors from being confused with patients. Lab coats are primarily used by medical professionals, research chemists and others who must work around hazardous materials in a laboratory setting. Most lab coats are constructed from tightly-woven cotton, cotton/polyester blends or disposable paper cloth.